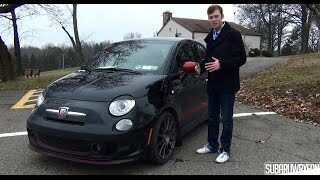 The small sized Fiat 500 Abarth is gaining popularly tremendously with the passing time and to treat its buyers with something new, Fiat revealed its all new Fiat 500 Abarth 2014 at the New York Auto Show. This high performance city car (as if you expected a track model) this time gets some attractive updates in its interior and also for the first time, after its release an automatic transmission mode too. Let us scroll down a little to know more about it. Interior of Fiat 500 Abarth 2014 brings more changes with it. List begins with the eyes gazing at redesigned center console and updated instrument panel. New technological advancement gets attractive with the change in display of seven-inch screen when you switch to sport mode. At this mode display enable the driver to stay notified with vital vehicle related information like fuel consumption and speed. The same display can also be used while you use the Rear Park Assist feature. Apart from all these you’ll also find a newly designed cup holder located in the interior and also a USB port, integrated in system. In total rounding up the entire interior of Fiat 500 Abarth 2014, we found it classy, innovative and comfortable enough for day to day rides. 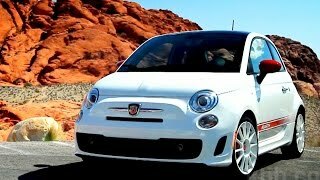 The exterior of Fiat 500 Abarth 2014 doesn’t bring any change with it, it’s the same traditional look you had with its predecessor. Oval headlight above round indicators, bumper with tiny air vent on its side and an elongated in bottom for proper air circulation to engine and brakes. ‘Downhill’ rear that adds cuteness to the entire exterior look, everything remains as it is. However we don’t find it wrong as this is what we have loved, and being precise major changes are provided in interior which makes it a mile ahead than its predecessor. Fiat 500 Abarth 2014 gets its power through 1.4 Liter MultiAir engine which delivers total output of 157 hp and peak torque of 248 nm. Engine is paired to a six-speed automatic transmission for the first time (optional). Also coming with it is Sport Mode, which provides better riding experience. 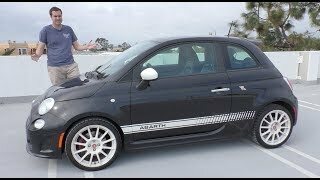 With its power figures the Fiat 500 Abarth is capable of doing 0-60 mph sprint in 6.9 seconds while the top speed touched the mark of 129 mph.